The University of Louisiana-Lafayette Ragin’ Cajuns swept the University of Arizona Wildcats on the third weekend in May during a best-of-three-games series and advanced to the NCAA Women’s Softball World Series. Talent, practice and hard work played a role — but backup pitcher Victoria Brown said her stuffed frog helped too. She said she always brings along her stuffed frog, cell phone and headphones. The frog is just one of the many superstitions held by the Ragin’ Cajun squad. Christina Hamilton, a starting pitcher, is known for the no-lens glasses she has worn since high school. Her father thinks the glasses are an “intimidating factor” to some batters. During a high school game, she accidentally popped out one of the lenses. Hamilton, now a redshirted junior, was challenged by her teammates that she would not continue to compete without both lenses. Hamilton pushed out the other lens and headed back to the mound. More than five years later, Hamilton is playing the same way. During the season whenever she has not worn the heavy-rimmed glasses, because they were broken or lost, she did not play as well, her father, Tim Hamilton, said. Most Cajuns players expressed the need to keep the same routine. They wear the same cleats, same batting gloves, same sliders, same headbands, same hair bows and other accessories — sometimes going weeks without washing them. Elkins said the holes in the batting gloves she refused to discard became so huge that she was finally forced to replace them. The simplest routines can take on significance, the women said. Before the game, they warm-up with the same people and stand by the same person during the National Anthem. 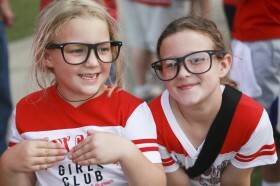 Their parents even have their own game-day superstitions. 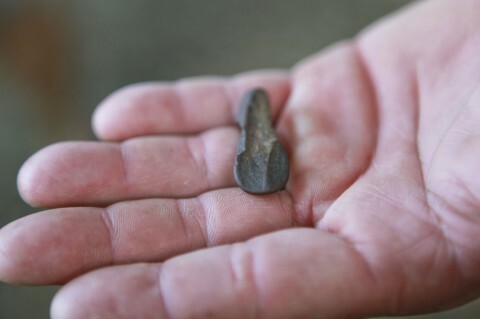 This season against Western Kentucky University in Bowling Green, Ky., Elkins’ father found a “magical” rock. When she “goes up to bat, he rubs the rock,” Tammy Elkins, her mother, said. In a series against the Western Kentucky University Hilltoppers, she hit two home runs with eight R.B.I.s, went five for 10 at the plate and was named Sun Belt Conference Player of the Week. On the way home, her father searched hard and found the rock, which resembles “a flat leaf, but a little thicker,” her mother said. Once it was back in his pocket, she started playing well again. Lexie’s father is not the only one in the family with superstitions. Her mother wears the same black floppy hat to all the games. Elkins said she believed her mother was trying to be more stylish than anything else. “She always wears it; she thinks she cute,” Elkins said of her mother with a laugh. And it is not just the players and parents — many fans said they had their own lucky routines. “Being a fan is a really tough job some days,” said Jan Jumonville, a self-proclaimed super fan for more than 20 years. She has worn her special hat for all five of the team’s World Series appearances since 1993. “I do not normally bring that hat out,” Jumonville said. She wore it for the tie-breaker regional matchup against the University of Texas and Louisiana crushed the Longhorns 10-1. 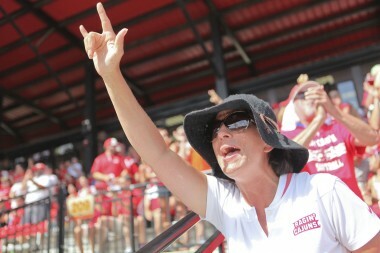 Vincent said she and her husband have been following Cajun softball for over 20 years. They never had any children on the team, but she said they consider all the players and fans part of their family. For some fans, the routine is more than wearing the same article of clothing. Crystal Bourque, a graduate of the university, said she rarely attended games as a student. “I really got into it after I graduated,” she said. Bourque has been a fan for more than 20 years and a season ticket holder for more than 10. “I never knew anyone on the team personally, but I became a really big fan.” For several years, Bourque went to home and away games with an older friend, Jim Polick. “He was an avid fan,” she said, and they became good friends despite a 45-year age gap. Polick died last summer and, in remembrance of him, Bourque bought his season ticket and now she carries a sign with his picture. 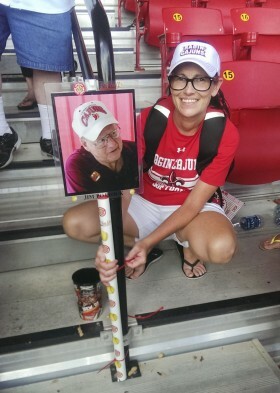 At home games, she uses a zip tie to attach the sign to the railing near his old seat, behind home plate.